On October 22nd, 1941 Arthur was called up for service in the Royal Air Force at the age of 18 years and 7 months. The recruiting centre was at Patgale which was a war-time camp. The quarters were all Nissen Huts and after the men had been issued with uniforms and other equipment they were moved on to other training centres. All civilian clothes were sent home, Arthur was sent to Blackpool which was a training centre for Wireless Operators/Air, intended for Bomber Command. This time the trainees were placed in civilian billets. These were boarding houses, which in peace time, were used by holiday makers. However, the land ladies were still the same ones and knew how to look after their "guests". The training centre in Blackpool was converted tram sheds where the men were given the basic training as `Wireless Ops`. In order to pass the course a speed of receiving and sending Morse code at 18 words per minute had to be achieved and 100% correct. As the speed was increased (There were tests at 5 W.p.m. at first, and so on) more and more recruits failed and were "C/T'oc" (ceased training) and sent off to other units to train in ground trades. At the end of the course, less than 50% went on to the next stage. London was quite a good place to be stationed in spite of the 'Blitz' and the blackout. The airmen were billeted in the best part of the West end and there was still plenty of entertainment available. From here the newly-trained Wireless Ops. Were sent to various airfields to gain experience in signals work, now a leading Aircraftsman Arthur was posted to Silloth on the Solway Firth, where there was a Coastal Command Operational Training unit. In March 1943 Arthur was posted to the Air Operations Section of No 2 Radio School at Yatesbury, in Wiltshire. After just over 20 hours of training in the air in Dehaviland Dominies he was sent to Stormy Down in South Wales for a 2 week Emergency Gunnery Course. This was to ensure that all Air Crew members could operate the Browning Machine Guns in the case of an emergency. Arthur was promoted to Sargent. Training was now speeding up and the next move was to No 2 Advanced Flying Unit at Millom in Cumberland where the students were passed out after 10 flying hours of intensive Radio operation. In June 1943 15 pilots, 15 Navigators, 15 Wireless Ops., 15 Bomb Aimers, 15 Rear Gunners found themselves in the sergeants mess at No. 23 Operational Training Unit, Pershore Worcestershire. They were then told to form themselves into 15 crews to fly Wellington Bombers on Operational Training, Most of the men were members of the Royal Canadian Air force with a few British to fill in the gaps in their crews. The aircraft in the photograph is a Mark 111 Wellington, the crew settled down well together and completed 8 weeks of intensive training with 150 hours of flying, mostly at night. After a short leave, the crew moved to 1664 Conversion Unit at Croft, in North Yorkshire. Here they changed to four engine Halifax bombers. They now needed two more crew members, a Flight Engineer and a Mid-upper Gunner. The F/E was Sgt Harris and the M/U Gunner was Sgt Auld, they too, were both Canadians. The conversion to Halifax's took 30 Flying Hours as well as a lot of ground work. Since 5 of the crew members were Canadians it was no surprise that they were sent to a Canadian Bomber group. The squadron was No. 419 "Moose Squadron", based at Middleton-St. George, in County Durham. They arrived on 30th. September 1943 and on the night of 3rd. October they went on a Bombing Mission to Kassel. On the 5th. October they bombed Frankfurt and on the 8th. Hanover, and Kassel again on the 22nd. Arthur's flying log book for the month of October 1943 shows that they had to make an emergency landing at Cottishall on returning from Hanover. Between October 1943 and mid-June 1944 Arthur's crew flew 36 Operational flights over Europe including two to Berlin. The crew flew 17 operations in this aircraft. In April 1944, my Grandma and Arthur were married at St. Luke's Church, Cradley Heath. Almost up to the last minute Grandma could not be sure Arthur would be able to get leave on the 22nd. Which was the arranged date, fortunately all was well as he arrived home on the 21st. Because of shortages weddings in war time went short of most things. There was no icing for cakes or clothing coupons for dresses. In spite of this, and the allowance of only one car, it was a happy and successful day. Grandma had to borrow her sister-in-law's wedding dress. After 'D Day' and one more daylight operation to Boulogne Arthur's crew finished their tour. The crew broke up and were posted to different Operational Training Units as instructors. By now Arthur had been commissioned and was a Pilot Officer. Arthur spent the rest of his war service as a Signals Instructor and as Signals Officer, he left the service in August 1946. In 1984 Arthur was contacted by the police who told him that someone in Canada was trying to get in touch with him. It was his war time pilot who lived in a town called Beausejour, 40 miles north of Winnipeg. 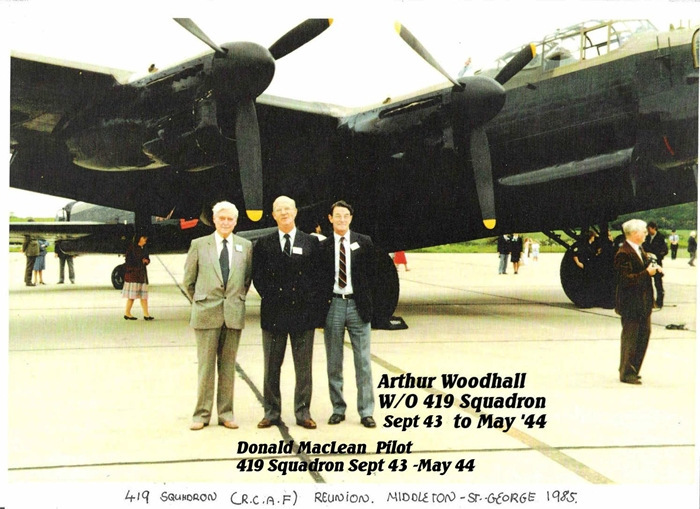 In September there was to be held a 40 year air-crew reunion and could Arthur go? In fact both he and Gladys went to Canada that year for three weeks and they attended the crew reunion. The five surviving members of his crew met up again for the first time since 1944. One of the missing members was killed in action in 1946. The other died in Canada in 1982. 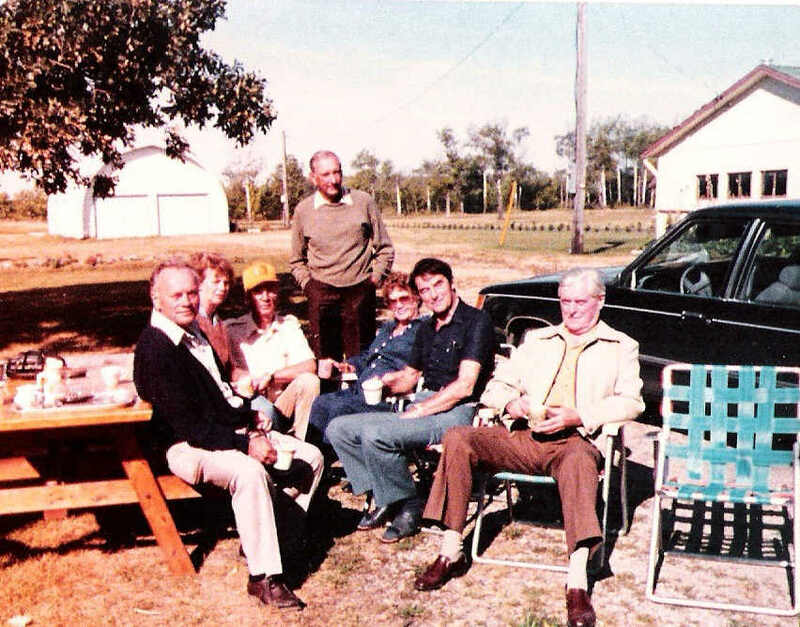 The photograph shows the five and their wives in Beausejour, Manitoba.